I’m going to say it, red is going to be the new pink. 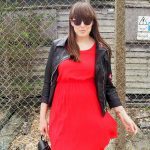 OK, probably not as big, but I’m really loving red at the moment, which is totally new for me, I’ve always been a little worried about wearing the bold hue before, and when I have it has always been as a ‘going out’ look rather than day. 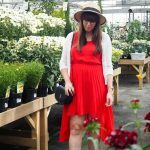 So, I decided to challenge myself to style up this one red dress, which FYI has been in my closet for an age and I’ve only worn it once, two ways, a daywear look and then a casual eveningwear look that’s perfect for a lovely summer (if not very windy) evening. Can we just talk a little about this dress, it basically has all the things I love, pleats, you guys know how much I love pleats, block colour and a floaty dipped hemline, which I adore wearing, I just find them super flattering to my less than model-like thighs!!! 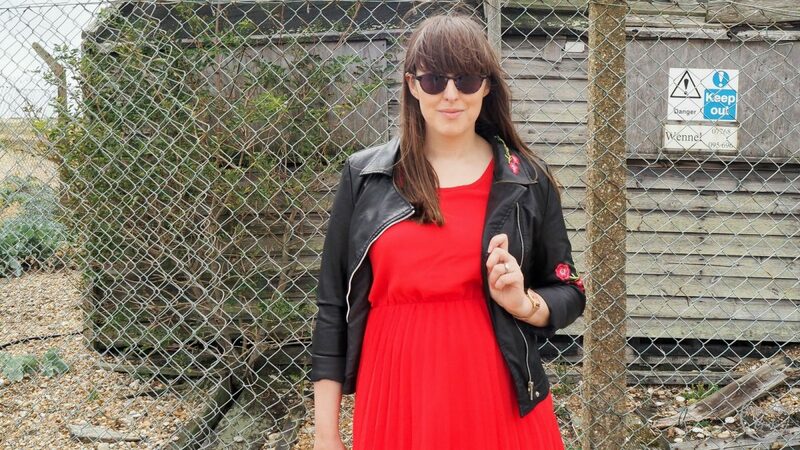 For the day, I decided to keep it super casual and teamed the Boohoo red dress with my go-to Gucci-esq trainers from Ego, which have been my saviour this summer I love wearing them and they work so well when paired with dresses. Keeping the white vibe going with the cardigan, to keep the chill off my shoulders, and then finishing up with my favourite summer hat from Mango, which I still can’t believe was less than £20, definitely one of my best summer buys. The whole look was so comfortable, it made me feel less worried about wearing so much red, which has always stopped me from working it during the day. It’s so much easier when it comes to styling red for the evening, well I think so, and for me, it was all about this leather jacket, a beauty from Izabel London, a newish website for me, which always seems to have a great selection of biker jackets and I love the subtle floral embroidery on this one, especially as it ties in perfectly with the dress. I then kept the same Mango bag, which is great for both the day as a cross-body and then in the evening as a clutch with its round handle, and then added on a cute pair of black heels. All I’m missing is red lips!!! How would you style up this red dress from day to night? Previous Post How Do You Get Out Of A Style Rut?